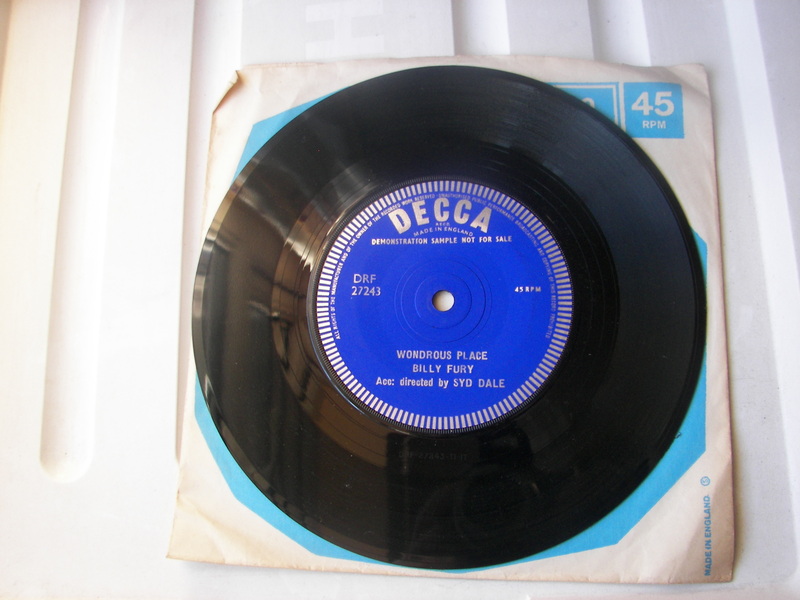 A few weeks ago I picked up this Demo record – Wonderous Place by Billy Fury . It looks pretty much unplayed , apart that is from the couple of times I have played it. As a record collector it really made my day to find this. Fury had a tragically short life. He was ill and was not expected to live beyond childhood. 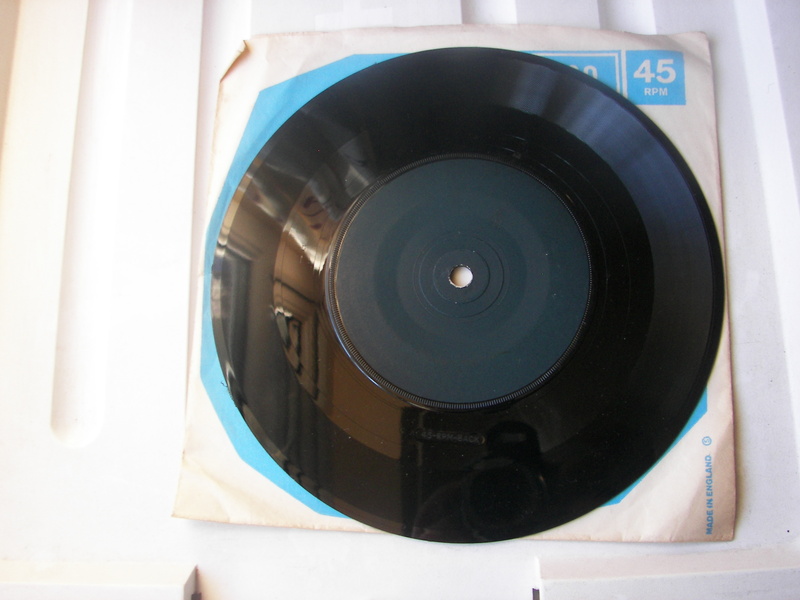 The B side of this record is blank although I did actually play it……It retains it’s original sheen and is in beautiful condition. Fury had several hits in the mid to late 50’s but by the time the Beatles released their first record in 1963 Fury’s star was on the wane. Like many other early rock n roll stars he was more or less written out of the history of rock. This had a lot to do with class. Fury was a working class boy and by the mid 60’s more and more young people were going to college , becoming middle class and adopting middle class class prejudices. Fury and many others were a reminder of their working class roots – something that these middle class kids did not want to be reminded of. The sixties were not quite as liberal as the sixties generation like to think or have us think. This situation remained up until about ten years ago when rock historians began finally to acknowledge his contribution to the birth of british popular music. Bill Haley suffered much the same fate and Haley is still out in the wilderness. Someone should write a thesis on Haley….he really was written out of history. Even today ageing rock stars looking back to their roots develop total amnesia when it comes to Haley. There are many theories as to when or how Rock ‘n Roll first started but the truth is that without Bill Haley it might never have existed in the first place. There are a whole army of folk who will tell you that Big Joe Turner’s Shake Rattle and Roll is THE REAL THING but they forget that if Haley had never recorded the song they probable wouldn’t have ever heard Joe Turner’s name. Bill Haley died a more or less forgotten man. Towards the end he would phone people up in the night or the early hours of the morning , people he had met briefly at some point in his career just to talk about the old days….He might not have met them in 40 years….Some studio engineer who might just happen to have been in the same studio that Haley was recording in would wake up decades later at 2:00 am to hear a voice say , – ” Hello , this is Bill Haley”……..
Elvis Presley , Bill Haley ……..Billy Fury – we will never see their likes again. They just don’t make legends like that any more. Excellent post, and you are right those “Working Class Hero’s ” of Rock & Roll whose attitude would be copied my middle class bands years later would never receive their just rewards. Thank you for you comment……..and keep the faith.